It's the habagat season and try as we may, to wait for a semblance of a glorious sunset, it wasn't meant to be. 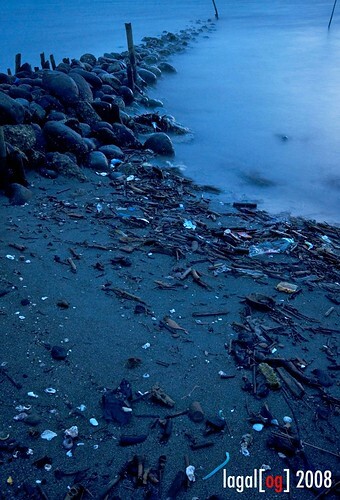 In the fading light and the imminence of a squall, the shore of Balaring in Silay, Negros Occidental, is a picture of a beautiful, blue mess.T here's truth to the fact that what we throw to the sea, the waves bring back to us -- a harvest or rather, a bountiful catch of trash swept to shore. i observed the same thing when i was in capones. im really dismayed whenever i see beaches and areas where people just throw their waste everywhere. "what we throw to the sea, the waves bring back to us". this is true. you made the mess look nice...hehehe. great photography. i enjoyed my visit. On a sidenote: even the ugly side of things look beautiful when photographed by you. wulfriend! you're right, i think my inspirations are garbage's beautiful garbage and switchfoot's the beautiful letdown. dom, the sea doesn't discriminate which side of the pacific or atlantic one is on. it just toss back what it is thrown. thanks happyhelen. glad you enjoyed your visit. thanks arlene. gigo is so true. maybe the ultrawide lens just made the mess a bit more palatable than it is. wow oggie, lalo mo ko pinapahanga, kahit dumi napapaganda mo. great job. nice capture. the shore got a life even if garnished (garnished talaga eh) with thrashes.